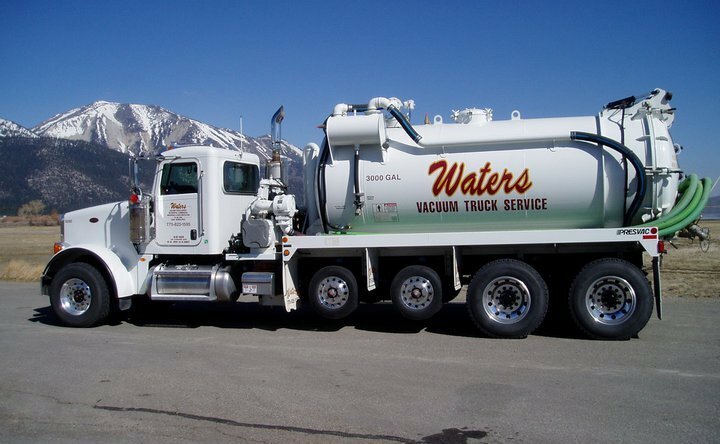 Waters Vacuum Truck Service’s longstanding relationship with the Northern Nevada and Eastern California regions has given us the opportunity to expand into multiple fields of service. Our goal is to provide an all-encompassing product for our customers and to bring them the total package for all their vacuum truck services. State-of-the-art equipment allows us to field any job brought before us, and our expertly trained personnel delivers high quality service at an efficient and rapid pace. The Truckee Meadows has trusted Waters Vacuum Truck Service for more than 50 years, and in return we have developed outstanding customer service to accompany our rapid response times and flexibility to cover any job. We excel in the installation and maintenance of home Septic Systems, which includes residential engineered systems that bring added complexity and uniqueness to a job. We also have the know-how and equipment to perform everything from simple Drain Cleaning to large scale liquid waste clean-up and de-contamination. We can also assist those looking to sell their home by preparing them for a Home Sale Inspection. Our experience in Home Sale Inspection preparation gives us the opportunity to work with Homeowner’s Associations for maintenance and upkeep. If you need your Grease Interceptors or Sand/Oil Interceptors cleaned, Waters Vacuum Truck Service can handle that with ease. Even if you simply would like to set up a preventative maintenance schedule for Drain Cleaning or your Storm Drain Systems, we will have a professional crew on site to perform all operations and to communicate with you on an effective schedule for your business. We offer flexible schedules and prompt service to businesses in the greater Reno, Sparks and Carson City areas. One appointment for our commercial services will help you understand why we’re the regions leading hauler of non-hazardous liquid waste. Our state-of-the-art industrial vacuum loaders can complete your Hydro Cleaning and Hydro Excavation projects smoothly and quickly. If you need Flow Control or flow bypass, Waters Vacuum Truck Service’s amazing equipment can handle volumes. Everything from a few dozen to several hundred Global Precipitation Measurement, our industrial equipment helps large and small operations keep their business running smoothly. There are no Emergency Spills too small or large for the variety and quantity of equipment that Waters Vacuum Truck Service has ready and available at all hours. We are the region’s choice for a rapid response to sudden flooding or water breaks. Confined Space Entry: Services performed inside anything that has not been designed for normal human occupancy. Electronic Locating: Expert locating of underground tanks and lines, such as Septic Tanks and Drain Fields. Rescue and Recovery: The art of rescuing precious objects (living or not) in a safe manner avoiding harm to the object. Storage Tank Rentals: Portable 21,000 gallon storage vessels available for rent. Products: We offer multiple products related to our services.